This past weekend I put months of training to the test and completed my first half marathon, the Good Life Halfsy. With two and a half months of training, my last month sidelined by a horrible cough, and never quite learning how to pace myself so I could run for more than two miles straight, I was terrified Sunday morning as I waiting to start this 13.1 mile journey. Under three hours later and running through the first nine miles I crossed the finish line with One Republic’s “Marching On” pushing me forward. I quickly found my family and got my finisher medal and was ready for a nap, a shower and some food. This experience was one that I was not ready for – physically or mentally. I actually had never ran farther than two miles without walking breaks until last week, and with my training plans had not gone further than 5.75 miles. Completing 13.1 miles was a mental hurdle as well, I was worried about getting sick, about coming in last or quitting halfway through. Around the 9th mile I gave in and listened to my body, my right hip was causing me severe pain and I had to start walking. For the next two and a half miles I power walked my way through until I got to the Lincoln bridge that overlooks the city skyline and campus. With the lyrics “get your legs and walk ‘cause we’re not too far, a little more to go, but we’re marching on,” and “the bridges are gone and we’re almost home, the end is close” I started to pick up the pace and started to run again. As I made me way across the bridge I saw Oldfather Hall (where my office is) come into view and realized that this is my life now – a life as a working professional in this city and marching on through my future. By the time the song ended I crossed the finish line and had completed my first half marathon. 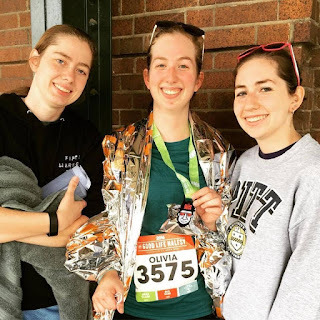 I made a crazy decision to sign up for a half marathon, but with my training and support of family and friends I took it step by step and met a goal of mine. It’s a bit of a stretch, but it applies to the last six months of my life – I “signed up” for my first professional job, took the steps and training to get into my position, had times when I wanted to cry and felt like I was making a mistake, but I pushed through and the end result was worth it. It wasn’t easy, but each small step leads to something bigger and rewarding – believe in yourself and you can accomplish anything, and realize that it really is the Good Life.